Oil, rice, corn, the Euro--commodities these days are hot, and they're getting hotter. This engaging and thorough guide covers all the basics you'll need to profit from today's most active investment classes. Commodities Demystified takes you straight to the heart of the subject, beginning with a discussion on the basic elements of the commodities market. It then introduces you to the various available commodities and investment options, including exchange-traded instruments, futures, and options, and explains the correlation between inflation and commodity prices. Finally, each chapter ends with a quick-review quiz enabling you to test your knowledge. 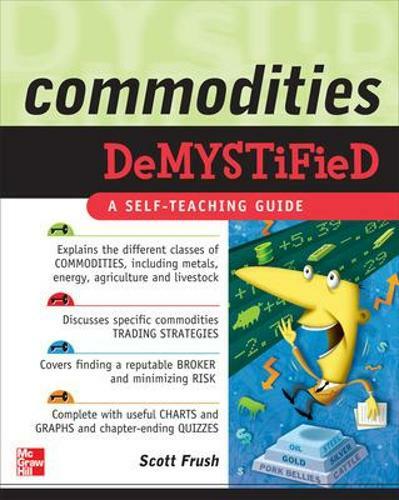 Designed to provide a thorough education without overwhelming you with complexities and mystifying jargon, this self-teaching guide is exactly what you need to successfully identify and trade commodities in today's market.